VUE is the premier luxury lifestyle magazine of North Jersey that reaches the most sophisticated audience in the region. VUE targets the most affluent readers with the highest level of disposable income and spending power in the market. The quarterly publication provides readers with a first person perspective that celebrates the most prestigious lifestyle, real estate, and luxurious design. In a recent story about re-imagining your home, Vue highlighted one of Serious Audio Video’s more unique luxury amenities. A love of music can be expensive. If you’re a musician, it’s the instruments, but if you’re a serious listener, it’s the sound system. 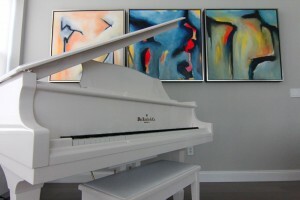 For some, a sound system just isn’t enough, as one resident proved with his decked out Edgewater, NJ apartment. To begin with, 16 Stealth Acoustics speakers were installed throughout the penthouse, so that one can listen to music from any room, but sometimes, the mood calls for something different. This is where the Bösendorfer automated piano comes in. 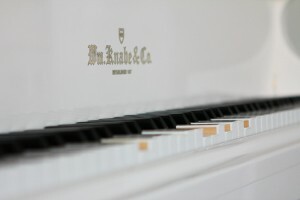 Yes, it’s all well and good if you can play the piano, bust out in the occasional Moonlight Sonata, but this piano is special because it is integrated to the system in such a way that the music library can be played back through the piano. It’s like having your own personal lounge musician. Installed by Serious Audio Video, Inc., the whole system is controlled from Elan’s g! Entertainment and Control System, with an Elan touch panel in every room, but for added convenience, the system can also be accessed through one’s smartphone and tablet.